Named "Father of Asian Electric Vehicles" by Global View Magazine and "Asia's Best Technology Pioneer" by Asiaweek, Prof. C.C. Chan tells the story of a man who made his childhood dream come true. Life is a roller-coaster ride! "Endurance is the key to success, especially during downturns!" Indeed. With only $50 in his pocket when he first arrived in Hong Kong in 1976, life has not always been a smooth ride. But Prof. C.C. Chan was not disheartened. He stayed positive and believed in maximizing one’s own strength. "Some overseas Chinese who came here with me found easy jobs at the pier as labourers to earn their living. If I had worked as a pier labourer, I wouldn’t have earned my own living because I am not physically strong enough. How many loads of stuff could I possibly carry? I decided that I had to take a path where I can apply my skills." He eventually landed a position in a Hongkong Electric Co Ltd in 1976 as a Research Engineer, and then he joined the Hong Kong Polytechnic and the University of Hong Kong in 1977 and 1981 respectively. With his intelligence, hard work and determination, he accumulated extensive experience in electrical engineering and paved the way for his success as one of the world’s foremost authorities on electric vehicles. Prof. C.C. Chan is currently Honorary Professor of the Department of Electrical and Electronic Engineering at the University of Hong Kong. 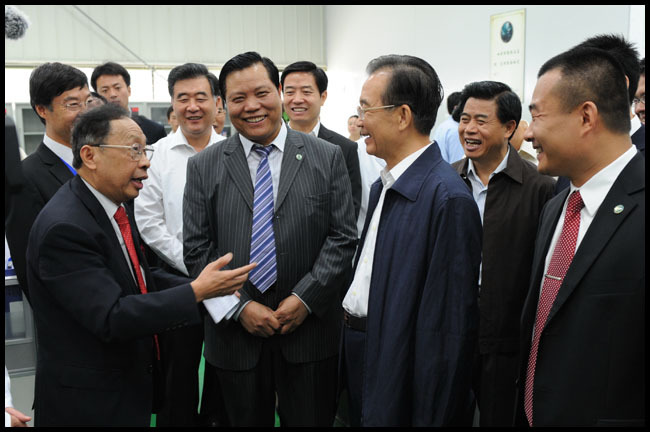 Born in a Chinese entrepreneur family of Indonesia in 1937, he was happy to witness the birth of a new China and went to Beijing to study Electrical Engineering in 1953. In the 1960s, he began researching electric traction in coal mines. After moving to Hong Kong in 1976, he obtained his PhD at the University of Hong Kong and stayed on to engage in teaching and research on electric vehicles. He has been actively involved in electric vehicle projects around the world and was former Head of the Department of Electrical and Electronic Engineering at HKU. Prof. C.C. Chan has witnessed major historical events throughout his life - the World War II, the Dutch colonization, the Japanese invasion of Indonesia, the Indonesian independence and the birth of a new China. He has also personally experienced crucial political and economic movements, including the cultural revolution in the 60s, the booming industrial growth in Hong Kong in the 70s, the handover of Hong Kong to China in 1997, the Asian economic crisis in 1998, and so on. "Life has to end at one point, but our spirits last forever." He feels that he is lucky to be healthy so that he can continue working. Even after his retirement, he is still dedicated to training and nurturing the next generation. He currently has postgraduate students in Hong Kong, Mainland China and overseas. He serves as Visiting Professor of a number of well-known universities around the world, including MIT, University of California Berkeley, University of Cambridge, etc. He is Co-founder and the President of the World Electric Vehicle Association, the President of the Electric Vehicles Association of Asia Pacific, President of the Asian Electric Vehicle Society, and Past President of the Hong Kong Institution of Engineers. He serves as Senior Consultant to governments, Advisor or Independent Director of international leading companies. In 2007, he served as Advisor to Oakland Independent to Oil Task Force. Prof. Chan is a Fellow of the Royal Academy of Engineering, U.K., the Chinese Academy of Engineering, the Ukraine Academy of Engineering Sciences, and the Hong Kong Academy of Engineering Sciences. He was awarded the Honorary Degrees of Doctor of Sciences and Doctor of Technology. He is also a Fellow of IEEE, IET and HKIE. He was awarded the IEE International Lecture Medal in 2000 and delivered lectures on electric vehicles worldwide. He received the “Environmental Excellence in Transportation Award” from the Society of Automotive Engineers U.S.A. in 2007, the Honour of “China Automobile Industry Character” in 2008, and the Gold Medal of the Hong Kong Institution of Engineers in 2010. Outstanding Third Age Citizens Award by the Hong Kong Council of Social Service in 2011; World Federation of Engineering (WFEO) Medal of Engineering Excellence in 2013; Royal Academy of Engineering Prince Philip Medal in 2014. With his multi-cultural background and international exposure, Prof. C.C. Chan has a mission to integrate the strengths of East and West for the advancement of science and technology to improve human welfare. Like most people, Prof. C.C. Chan has a childhood dream. "My father ran an auto business. When I was at primary school, I often played in the auto-repair garage. I had a feeling that the cars were cozy and beautiful on the road, but when they got to the garage, they became so dirty. The garage was full of grease and exhaust. Garage workers’ faces were black with soot, and their hands too. I wondered why a pretty car got so dirty as soon as it entered a garage? Could future cars be less dirty? Could they not burn fuel and not be so dirty?" His youthful dreams were not castles in the air. His study, career and research all circled around his dream. In fact, electric vehicle was invented in 1834, earlier than the internal combustion engine vehicle. During the last decade of the 19th century, electric vehicles were produced in America, Britain, and France. However, due to the limitations associated with the batteries and the rapid advancement in internal combustion engine (ICE) vehicles, electric vehicles have almost vanished from the scene since 1930. In the early 1970’s, some countries, compelled by the energy crisis, started the rekindling of interests in electric vehicles. In 1976, the USA launched the Electric and Hybrid Vehicle Research, Development and Demonstration Act, Public Law 94-413. From the 90s, the United States, Europe and Japan started launching electric vehicles on the market. China followed suit. In 2003, the electric bus test-run site was launched in Wuhan. Prof. C.C. Chan is the first person in Hong Kong to have been elected an Academician of the Chinese Academy of Engineering. His greatest contribution in science was the invention of AC motor driving system for electric vehicles. "I was among the first in the world to apply AC and induction motors for electric cars, since AC motors are lightweight and reliable. However speed control was not done well in the past. From the 1970s onwards, power electronics came into play and solved the speed control problem. We were the first to use AC motor on electric cars." Before AC motors were used, DC motors were used. DC motors need commutators to work, which adds to their weight and volume. The current in AC motors alternates direction and no commutator is needed. The structure can be relatively simple. In 1986, Prof. C.C. Chan published a paper that received the Best Paper Award from the United States IEEE in 1990. Since the 90s, most electric vehicles worldwide used AC motors including permanent magnet motors as their driving system. Although Prof. Chan was the pioneer of this technology, he was not dismayed about his own country not being the first to apply it. "Scientists invent things with the greatest hope that it will be used to help the society go forward and prosper. Science itself is without borders. It serves all mankind." Owing to this belief, Prof. C.C. Chan brought to the Mainland advanced technologies from abroad, and promoted exchange between China and international communities. Over the past 20 years, Prof. C.C. Chan has been teaching in institutes in the Mainland, sharing his decades of experience in electric vehicle research and introducing the latest technology from abroad. Now at the age of 70+, Prof. C.C. Chan spends a few months every year teaching and advising in different locations in the Mainland and abroad. He still works very hard and is hopeful that the younger generation will open a new chapter in the development of electric vehicles in China and elsewhere. "I have studied electric vehicles for over 30 years. My biggest wish is to see electric vehicles running on streets and alleys of big and small cities – it’s a contribution to the conservation of energy, environmental protection and sustainable mobility."